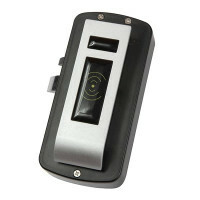 Z-496 EHT lock is the contactless reader combined with the standalone controller and electromechanical lock. Lock is powered by 4 x AA size 1.5V batteries. Z-496 EHT lock has a compact size, the internal clock, a big number of operation modes, ease of installation, programming and maintenance. Z-496 EHT lock is access control solution for various storage locations: lockers, changing rooms, office furniture, business equipment. Z-496 EHT electronic lock has been widely used at the objects such as spas, water parks, fitness centers, swimming pools. Z-496 EHT lock can be installed as a standalone entity or can be integrated into the existing access control system through a key card or using SDK Lock Manager as a part of object's integrated security system. "Fitness" mode allows you not assign a specific key to the lock. Any key can be used with any free locker. "Logic" mode allows you not assign a specific key to the lock. Any key can be used to any free locker. The number of locker and level of battery charge recording to the key when a lock operating in "Logic" mode. This is very useful in cases when the user has forgotten a number of his locker. "Logic" mode allows you to monitor the number of lockers occupied by one key (from 1 to 15 lockers). There is a possibility of lock registration and configuration using PC. "Normal" mode is the common mode of lock controller operation. The lock may opened only by the key(s) recorded in the lock memory (24 keys max). The lock in the "Normal" mode closes the locker when the user bring up a key first, and open after user bring up a key second time. "Deposit box" mode emulates the logic of deposit box operation. You need to bring one-by-one all the keys recorded to the controller database for opening the lock (24 keys max). "Custom" mode is the mode intended for solution of the specific tasks. You may describe the desired operating mode then apply to our service for development of special firmware. Updating the firmware lock is made using RF-1996 adapter.